OK so at the end of my travels in Central America (I leave for Colombia tomorrow morning) I have officially found PARADISE. Manuel Antonio is the most beautiful place that I have ever been. 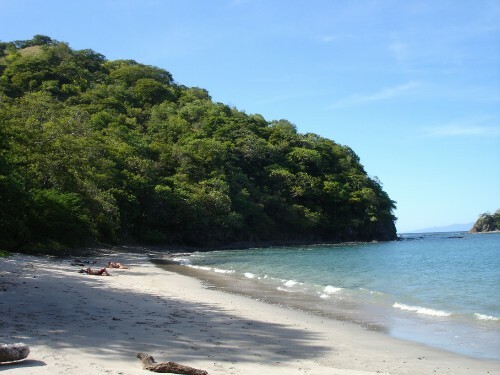 The only place which is similar in my opinion is the Whitsunday Islands - however the only drawback there is that you have to wear full wet suits as there are loads of jelly fish - none here, so Costa Rica wins!! Despite all the development due to the increase in the number of tourists here each year, Manuel Antonio is protected from this as the majority of the area is a national park for which you have to pay a $10 entrance fee. And, it is SO worth it. The beaches are simply breathtaking - white sands with monkeys hanging in the trees too hot to move, iguanas sunning themselves, slothes and numerous birds of all colours flying over head! There is so much wildlife here you don´t even need a guide to show you where to look. Given that there is an entrance fee the area is fairly uncrowded and a lot of people only visit for a couple of hours in the morning so you have the place to yourself. No one is trying to sell you sunbeds or bracelets or fruits, it is just so peaceful. There are three beaches and some viewpoints overlooking the rock formations. I have only explored two beaches so far so am heading back today as its unlikely I ´ll be back this way again and its the perfect end to an amazing time in Central America! The zip lining in Monteverde was brilliant and terrifying at the same time! The first two lines were fine, however for number 3 you had to go as a pair. Ian was behind and so would be doing the breaks while I would have no control at all... As you stand on the edge of the platform all you can see ahead of you is the cable stretching into the distance and disappearing into cloud. Below (miles down) is a beautiful valley and before you know it the guide has pushed you off the edge and you are flying through the air. An amazing feeling - until you near the end and I can see the other guide frantically waving for us to brake. ¨Brake¨ I scream to Ian, who replies ¨I´m trying!¨ at which point we both think we are going to die! Obviously its all quite safe and there is a braking system in place so you don´t fly in the trees somehow! The final zip (number 17) was the best. Its called superman and you are harnessed by your feet and chest with your arms out so you feel like you are flying. This cable was 1km long so it lasts forever and is so much fun! The only other place I visited before coming here was Montezuma which was fun. There is a boat trip to Torta-somthing island. We all went snorkelling and saw loads of fish and two beautiful turtles. The island was lovely and we had an amazing fish lunch. The weather has been incredible. Apparently the caribbean side is still raining however the pacific coast is scorchio with non stop sunshine! I am LOVING it and wish I could fly everyone out here so you can see how amazing it is! Anyway on this lovely Friday morning I am now going to head down to the warm crystal clear waters that await me! Hope you are all well and enjoying yourselves too.